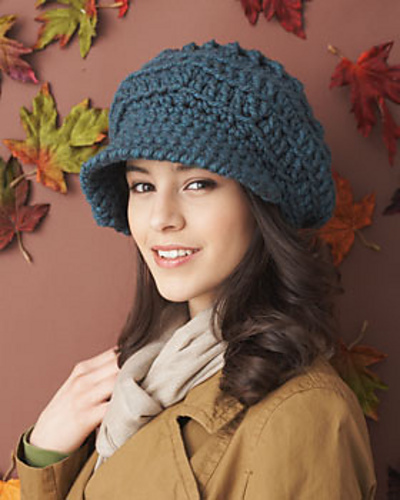 One Skein Crochet Hats for Women: 10 Free Patterns to Make and Wear! Hat season is in full force. 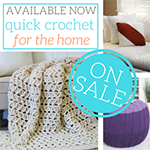 And crocheted hats are some of the hottest hats around right now – in stores, on celebrities, and everywhere you go! One of the best things about hats is that they’re typically a one skein project, made in just an evening. 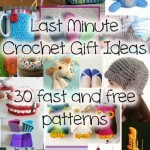 It’s a great way to try a new yarn, use up a bit of stash, or indulge in something a little more luxurious. 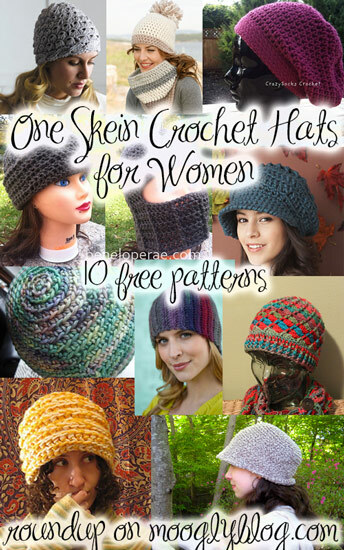 On that note, here are 10 free patterns for one skein crochet hats for women – each of which uses 180 yards of yarn or less! UPDATE 10/26/15: Before we get started, if you are looking for the brown hat with a tan brim and flower, that hat is only available on Amazon (click here) – it was never part of this collection of free hat patterns. 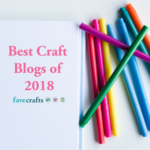 Someone (I don’t know who) uploaded that hat photo with a link to this article to Pinterest, and now many people are coming here for a pattern I never had, and cannot provide. If you have pinned that hat, please delete the pin, and feel free to pin one of these with this link! Divine Hat by Sarah Arnold, on Rheatheylia: (150 yds) I’ve made this hat myself, but here’s one my friend callisto9 on Ravelry made – and paired with the Artfully Simply Infinity Scarf! So gorgeous, a perfect yarn choice! 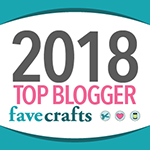 Super Slouch Hat by Danyel Pink, on Raverly: (150 yds) I love the texture of the hdc sts in this hat, and I really love how she uses different hook sizes to great effect! 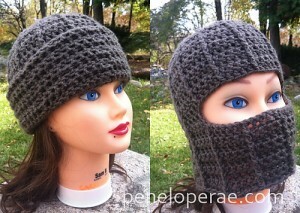 A great hat for beginners, though I think I’ll make one too! 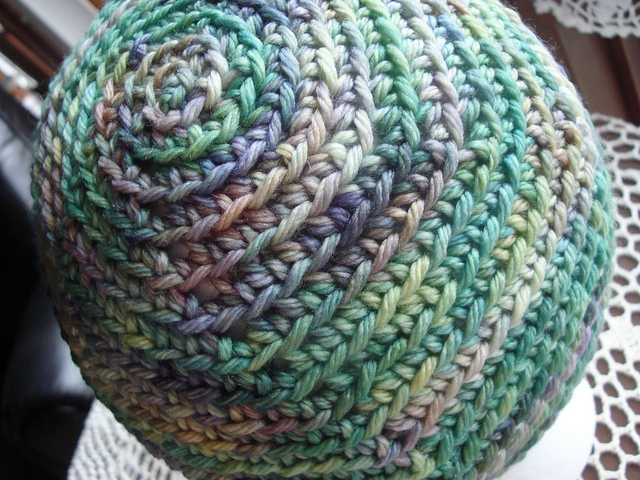 Spring Spirals Beanie by Tasha Wells, a Ravelry download: (120 yds) Great for smaller skeins, this pattern shows of both the yarn and the great look you can get simply crocheting in the back loop only! Another perfect hat for beginners! Midwinter by DROPS Design: (162 yds) With Super Bulky yarn you can make this hat in no time! 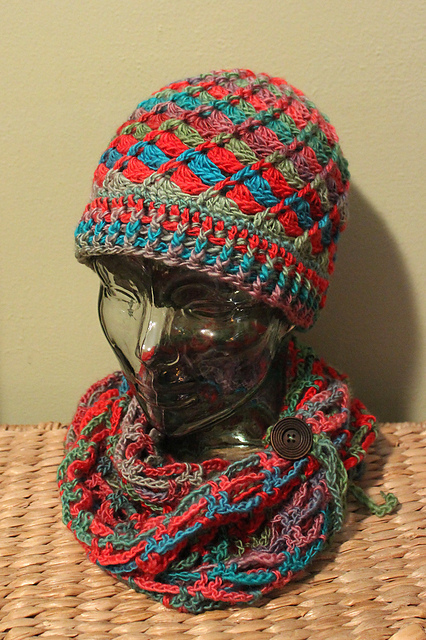 This pattern is written a little differently than most crochet patterns, with less explicit instructions, but it’s actually a pretty simple hat so don’t be afraid to give it a try! Fold Over Hat by Carrissa Knox, on Penelope Rae: (145 yds) I wanted to feature this hat because it can go from fashion to forest in a snap! I love the look when it’s all folded up, and as Midwesterner I know the importance of leaving as little exposed as possible when the worst weather hits. Instructions for an optional brim included! UPDATE: This hat is no longer offered for free, but is available for purchase on Ravelry. Easy Sideways Hat by Lion Brand Yarn: (147 yds) This one is hailed as the perfect first hat for crocheters – worked flat and then seamed, it stretches to fit just about everybody! 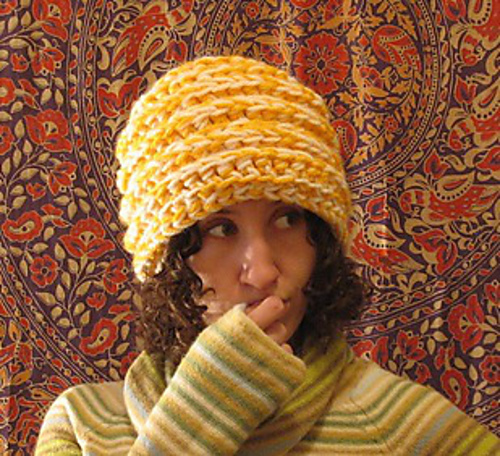 Triton’s Thinking Cap by Kelly McClure, a Ravelry download: (150 yds) This looks so warm and cozy! Instructions are included to make it with a variety of yarn weights too. I just want to curl up in this hat. Backloop Visor Beanie by Erica Jackofsky, on About.com: (138 yds) I love the profile of this hat! The brim is understated and the back curl adds a lot of interest. Slouchy Peaked Hat by Bernat Design Studio, on Yarnspirations: (108 yds) Oh hey, are those crossed stitches I spy? There’s lots of texture and interest in this hat. The big brim and slouch combine two very “now” looks too! Cables and Lace Broomstick Hat by Kristin Omdahl, free ebook from Crochet Me: (168 yds) This is just gorgeous, and the little pockets of air should be surprisingly warm! 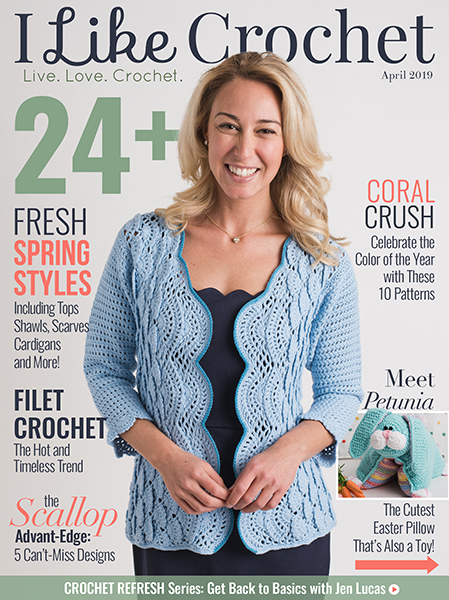 Uses both broomstick lace and crochet cabling, so lots to keep you interested here. Note though that lots of people have had to go way up in hook size, so be sure to check your gauge! BONUSES 1 2 3! 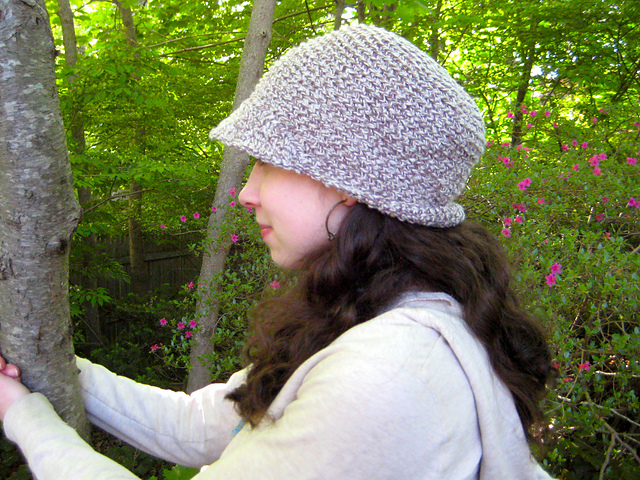 There are now 3 free hat patterns here on Moogly that only take a skein each: Luscious One Skein Crochet Hat , Spinning Summer Slouchy Beanie, and the Fallen Leaves Slouch Hat! 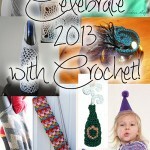 Have you made any hats yet this year? What about for yourself – don’t forget your own head! If you’re lucky enough to get a great skein of yarn in your stocking, don’t fret about what to make with just one skein – make yourself a gorgeous hat! Is there a hat pattern you’ve been wanting to try? Share it in the comments! Be sure to check out and like the moogly Facebook page to get the latest updates, links, and sneak peeks. Moogly is also on Pinterest, Twitter, and Tumblr – come join the fun! 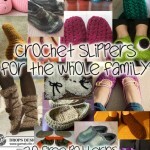 Crochet Slippers for the Whole Family: 20 Free Patterns! What brand of yarn did you use for the first hat and scarf combo? 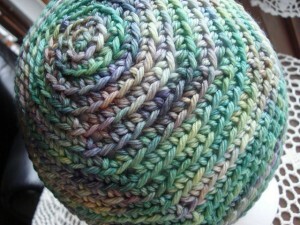 The link for the slouch hat doesn’t work..
Is there anything you did differently while making the Devine hat? I followed the pattern exactly and it just doesn’t seem to have the nice shape that your hat has. Any tips will help. Hi Melissa! 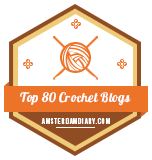 It can look a little wonky fresh off the hook, but a light blocking might help a bit! I don’t think I did anything in particular to it though. I wish I had a secret tip to share! I gave it another go (this time completing even though the shape was kinda weird). I wore it for a bit and now it has a great shape! I have now made many newborn baby hats using a modified version of the Divine Hat pattern. I. Skipped step 2, 4, 6 and used 3 Dc’s until the hat was the length needed. These are being donated to Project Humanity. Thank you! 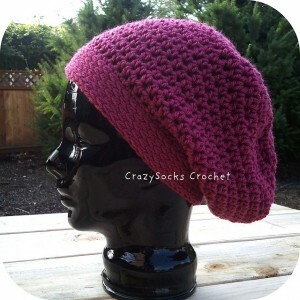 For some reason I can’t seem to get the slouchy peaked hat pattern. Can you help? Yarnspirations has been down for maintenance – hopefully it’ll be back up soon! The Divine Hat is such a lovely pattern! 😀 And thank you! Hi… I love these all, but I was sad that the link to the men’s roundup is broken and i can’t seem to find it anywhere. Hi Clare! Thank you! And…this is incredibly strange, as I can’t find it either! I remember writing it, but it seems to have disappeared into the ether. :/ Looks like it’s time to add hats for men to the roundup list again! Thank you for letting me know, and I’m sorry about that! 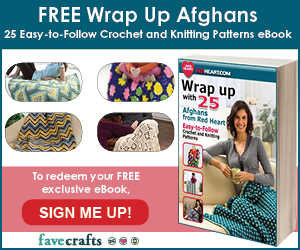 It says this pattern is free but I can’t find a download link. I can’t access the pattern for the divine crochet hat. Can you help? Thanks! 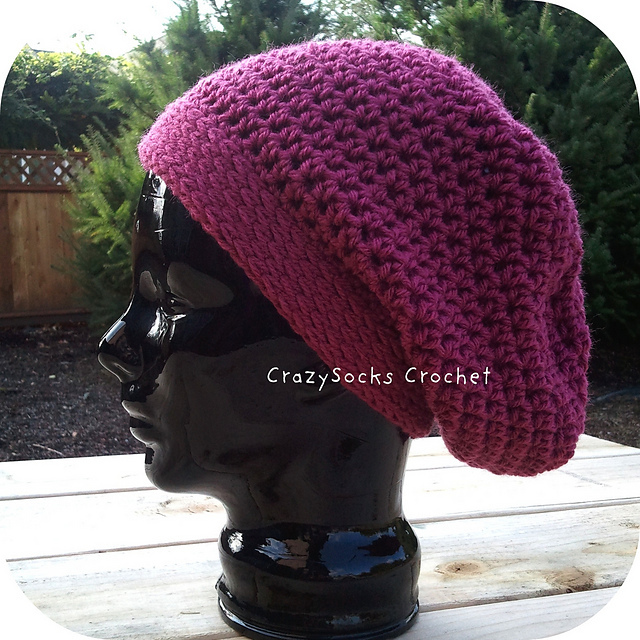 I made the super slouch hat and I love it! Im sad to say that the hat pictured on Pinterest that brought me here is not on this list. I found a picture of a black beanie trimmed in grey with a grey flower. I was wondering where that pattern is for that hat. Its really cute? I saw the picture on http://www.Pinterest.com. Looking for the pattern… didn’t see it after clicking the link. Can you help me with this pattern? So for any one who is looking for the so called Amazon hat that was accidentally linked to this site after a shirt hunt this ins the link http://overtheappletree.blogspot.com/2015/11/v-stitch-winter-beanie.html?m=1 I found it by Chance an it is a free pattern. Hi Nancy! Lots of unscrupulous people have linked other photos of hats to this article via pinterest, so I’m guessing that’s what happened here.